Ruby Red Grapefruits are great for juicing and the taste will leave you smiling. 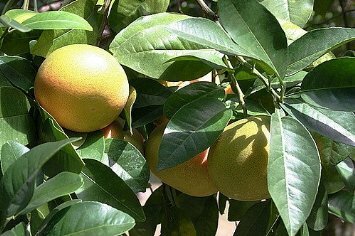 The fruit looks like ordinary grapefruit, except the rind is thicker and ripens with a red hue. Ruby Red Grapefruit trees work great as a patio plant. If you live in a cold climate, just bring it inside during the winter. They produce abundantly indoors or out. Just place it in front of a sunny window. Grapefruit are really good for you, healthy, nutritious and full of vitamin C and A. There is a phytochemical called lycopene which has been shown to reduce the risk of certain cancers. Please allow 3-5 days for shipping on these.